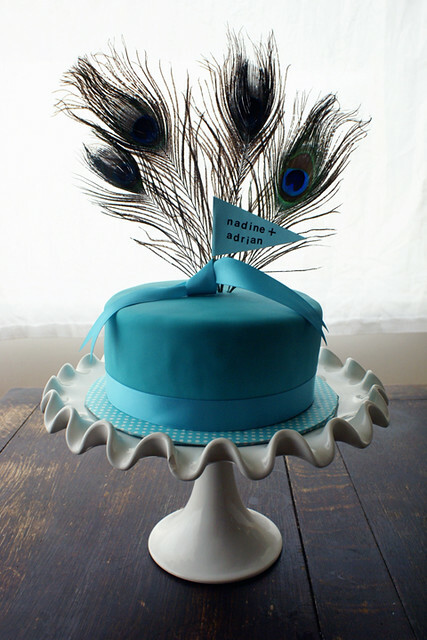 Coco Cake Land - Cakes Cupcakes Vancouver BC: Nadine & Adrian's Gorgeous Peacock Themed Wedding! Nadine & Adrian's Gorgeous Peacock Themed Wedding! 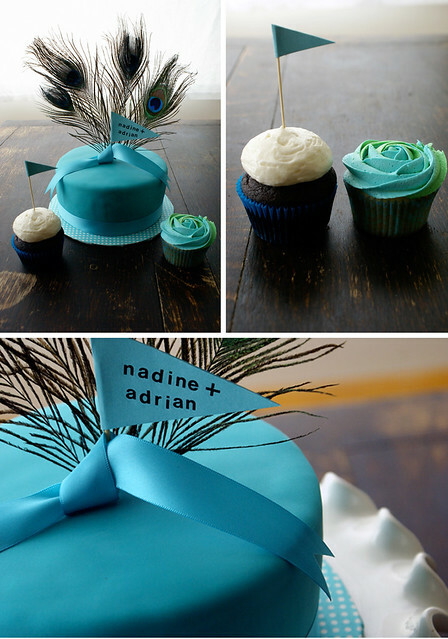 Nadine and Adrian were just the sweetest, nicest and cutest couple. I will hopefully add some photos of their gorgeous and lovingly designed actual wedding soon, both their wedding outfits were incredible... but for now, here are the cakes I made for their beautiful Sunday evening wedding party here in Vancouver! The buzz and excitement was felt in the room when I came to set up the cakes... peacock themed with a 20's meets 50's twist. The early evening sun was peering in to Heritage Hall, everyone smiling and in perfect and excited moods! I loved how the cakes turned out: Brown Velour (dark chocolate with vanilla creamcheese frosting) in blue, green and damask cupcake liners, and two tone peacock-colored vanilla cupcake rosettes to echo the design of the decor and colour theme of the event. Nadine dropped off peacock feathers for me to use in the cutting cake, so I trimmed and washed them and used them as toppers, along with a little handmade flag, some ribbon and a craft paper covered cake board! That color blue is amazing and I just adore the peacock feathers. Nice touch! I love how you get the mixed colours in the cupcake frosting. Just gorgeous!! They look too good to eat! WOW! This is gorgeous! You must be a genius. how did you mix the frosting colors on the cupcakes? did you layer the frosting? gorgeous work!! Hey Molly, you can email me at lyndsay@cococake.com! This cake is unreal. It's breath taking!